On Sept. 11, 2001, in the South Tower of the World Trade Center, a man wearing a red bandanna lost his life leading others to safety. 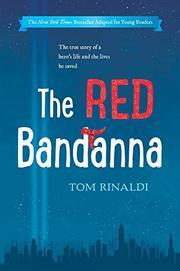 This is his story, adapted for young readers from Rinaldi’s 2016 bestseller for adults. From an early age, Welles Crowther was obsessed with firefighters. He spent many hours hanging out at the firehouse, cleaning the rigs, and listening to his firefighter father’s tales. But after graduating from Boston College, Welles decided to follow another dream. He accepted a position as a junior associate in a finance firm. His office was on the 104th floor of the South Tower, but the call of his childhood obsession was strong. He confided to his father that he wanted to change careers and become a firefighter. But before he could realize that dream, tragedy struck. Welles kept his cool but lost his life leading others through the smoke to safety. Based on an ESPN documentary, this slim book chronicles the life and the legacy of one 9/11 hero. Readers of this youth version will be inspired by Welles’ dedication to school, sports, and his family, but they will also laugh at his mischievous side. Photographs of Welles’ life are sprinkled through the narrative.